Happy Friday, all! Here are a few bits of happy around here on this beautiful May day! 1- On Thursdays, more often than not, we bake a little healthy muffin/bread breakfast for Friday and Saturday. It's a nice, somewhat controlled sweet treat to end the week. 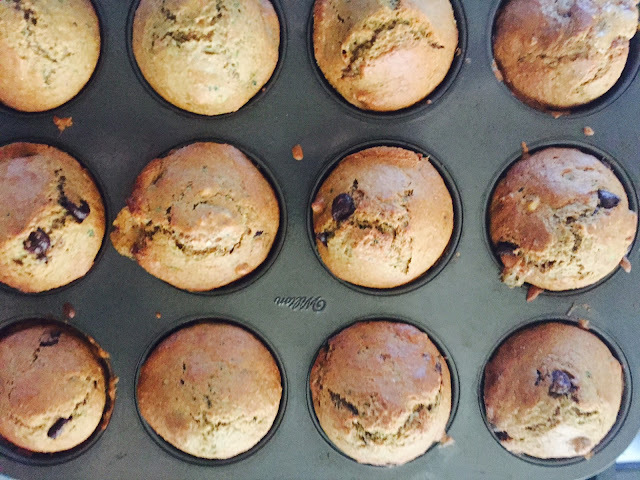 This week, we did zucchini chocolate chip muffins. 2- The kids tried a new pediatric dentist this week. Why didn't they have these facilities around when I was a kid? 3- Has anyone tried cashew cream instead of regular cream? In my quest to reduce just a bit of dairy/saturated fats from our lives, I made it and it is awesome! Used it in a garlicky mushroom, kale, leek medley and also as a cream for butternut squash soup. It was SO yum!! 4-This kid has the best facial expressions. If this doesn't warrant the #nomnom, I don't know what does. 5- And to all the mamas out there, have a wonderful Mother's Day. To my sweet mom, thank you for all you do and are to us. Your loyal heart, forgiving nature and patient spirit are truly one in a million. I also would like to specially thank you for my low blood pressure and late greying genes. Love you lots!! Happy Mother's Day weekending, dolls!! That muffin tradition sounds like a great idea! I love that you already have something whipped up for the weekend! And I'll definitely have to check out cashew cream! Happy Friday girl! I could totally go for one of those muffins right about now! Looks like your girls' new dentist office is amazing! Hope the staff there is as friendly as the facilities are fun! Happy Mother's Day to you and your mom! She sounds wonderful! Haha we have very similar faces when eating. Those muffins sound so good. I haven't had zucchini bread/muffins in so long! Happy Mother's Day! Looks like yummy muffins! The dentist looks so fun. Ours is fun but not that fun! Happy Mother's Day! I love the muffin tradition and those zucchini and chocolate chip muffins sound good! Yum! Those muffins sound great! Have a great weekend! Love the muffin tradition- I need to do something like that. Those muffins sound amazing. I love being able to sneak veggies into things like that. I hope you have a wonderful Mothers Day friend. I would love to try making zucchini chocolate chip muffins! Your muffins sound delish! Thank you for sharing. I remember hating to go to the dentist. Now days it is great fun.